The Playbook vs. the iPad. RIM just posted a video to its YouTube channel that shows off some impressive rendering speed for its upcoming BlackBerry PlayBook tablet versus Apple's iPad. Sure, this is just fodder to feed the BlackBerry fanboys, but if the PlayBook really is as fast as it looks in this video, then there might finally be a worthy competitor in town. Both tablets have WebKit-based web browsers that render web pages lightning fast — but only PlayBook has a dual-core 1Ghz CPU. The iPad is only single core. The PlayBook also has four times as much RAM as the iPad — 1GB as opposed to the iPad's mediocre 256MB. 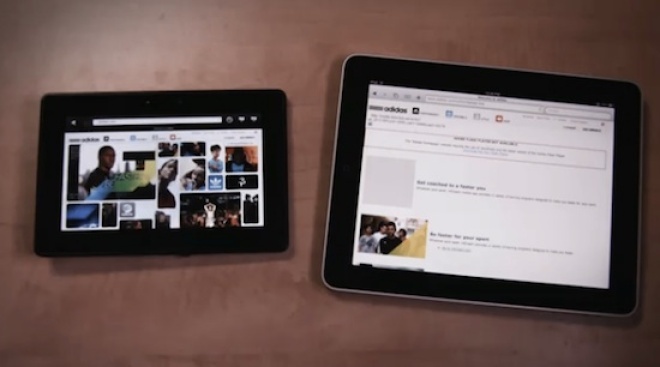 As you can see in the video, the PlayBook starts rendering images before the iPad even starts. Other notable mentions show how smooth the PlayBook handles Adobe Flash 10.1. The iPad seriously looks dated not being able to support Flash. The BlackBerry PlayBook is targeting the business-centric workaholic, but if this test is reflective of the final device then we'd say that BlackBerry heads will finally have something to boast about. We say bring on the tablet competition. The Galaxy Tab isn't exactly lighting up the world on fire with its average reviews so perhaps the PlayBook will be able to fill its shoes.